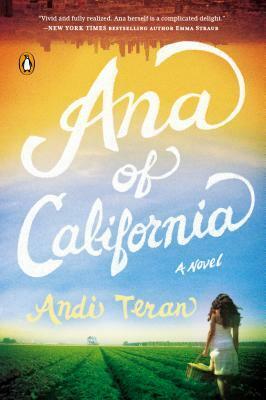 West Metro Mommy Reads: Book Review: "Ana of California" by Andi Teran + GIVEAWAY! Book Review: "Ana of California" by Andi Teran + GIVEAWAY! I'll come out and say it: whether or not you enjoy this book is dependent completely on your expectations going into it. This is a modern re-telling of Anne of Green Gables. Anne-with-an-e, the spunky turn of the century orphan, has been replaced by Ana-rhymes-with-fauna, a Mexican-American foster child who was orphaned when her parents were killed in gang violence. I love Anne of Green Gables, but I also recognized going into this that I could not, and should not, expect the whimsy of Anne Shirley and her life in Avonlea to be transferred to Ana's life. If you do expect that to happen, this book probably won't work for you. Now, after that dire warning, I will say that I thoroughly enjoyed this book. I actually loved that Teran took the framework of such a beloved classic and brought it forth into the reality of the current day. There are some very clear parallels--Ana goes to live with a brother and sister on a farm, (although the brother is more like Marilla and the sister is more like Matthew), "the boy" insults her hair, there is a hair incident, and there is a "bosom friend". And then there are other elements that are turned a bit--and I won't go into those because I think you should read the book to find them! There are some really dark elements in this book, which is not surprising given Ana's backstory, that have no equal in the source material. Also, while Anne of Green Gables is sort of an age-less classic, in that it appeals to everyone from children to adults, Ana of California is very firmly in the Young Adult Genre. Ana is a high school student and Teran brings up issues that kids today face in high school. Ana is a dreamy and spunky girl, but not in the same way that Anne is. Ana is a fighter--she's scrappy and scared. While Anne has wonder for the world, Ana is just trying to get through the world. But, again, Ana with Anne's wonder just would not work and would not believable for the reader. The cast of supporting characters were interesting. There were a few that were pretty direct translations--such as the Rachel Lynde and Josie Pye characters. Others, however, are more of a jump. As I've mentioned, there seemed to be a bit of a gender swap with the Matthew and Marilla characters (which probably works better here). Rye, who is the "Diana" character, still fills the role of the BFF, but her relationship with Ana is a bit more problematic. On a final note, I also would not go into this thinking that, since you've read Anne of Green Gables, you will know how this book goes. Trust me, it is a bit more complicated than that. But, that is really what makes it interesting. Teran doesn't re-tell Anne of Green Gables, she recreates it. The publisher, Penguin Books, has generously offered a paperback copy of Ana of California to one of my readers. To enter this giveaway, just fill out the Rafflecopter form. The giveaway will end at 11:59pm on 7/10 and is only open to US readers (sorry! ).